Chinese food | poor scientist. will blog 4 food. Here’s a yummy and easy recipe I came up with earlier this year. It took me another 6 months to test it, and I’m happy to report that it’s a winner! The version below is vegan, but I think it’d also be mighty tasty with ground pork or sliced chicken. Just make sure you marinate the meat in some soy sauce and rice wine, then cook it separately (before the eggplant) and set it aside. Add it back in at the same point in time as the tofu below. Enjoy! Heat the oil in a large skillet over medium-high heat. Add the eggplant, stirring regularly. When the eggplant is more than halfway done, push it to the side of the pan. Add 1 Tbsp oil and fry garlic and 2/3 of green onions in the center of the pan for about 1 minute. Stir the sauce, making sure to dissolve the corn starch, and add to the pan. Mix thoroughly. Add water if necessary. When eggplant is ~85% done, turn down the heat to medium low. Add the tofu. Mix thoroughly for another minute, taking care not break up the tofu. Turn off the heat. Garnish with the remaining green onion. 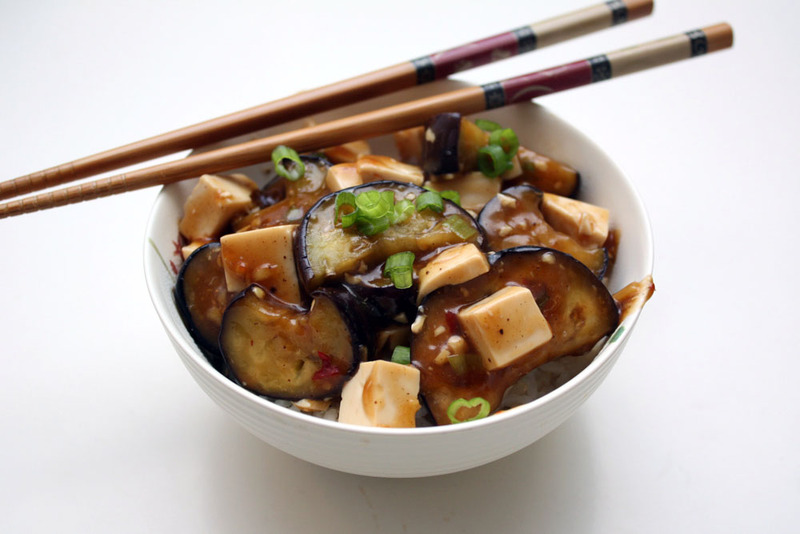 Categories: cooking, photos, recipe | Tags: Chinese food, eggplant, tofu, vegan | Permalink. Double Feature: Fried Rice Recipe + POU Project Announced! As promised, here’s the recipe for the fried rice featured in the last post. The great thing about this recipe? It’s cheap and easy. Oh, and delicious too! Heat one tablespoon of oil in a large skillet. Stir fry vegetables in the order of how long it take for them to cook. For instance, I started with broccoli, let them cook for a few minutes, and then added carrots. Add salt and pepper, to taste. Remove from heat and put veggies aside in a bowl. Heat 2 tablespoons of oil in same skillet. Add green onions and garlic, saute until fragrant. Push them aside and add the egg. Cook the egg, scrambled. When the eggs are 80% done, add the rice. Try to coat some of the rice with the uncooked egg. Mix eggs, rice, and green onions for about 1-2 minutes. Add the sauce to the mixture and mix thoroughly. Allow some of the liquid to evaporate and the rice to appear dry. Add the veggies (and meat). Mix thoroughly and fry for another 2 minutes. Remove from heat and serve. Note 1: It is better to cook the rice a day in advance and store it overnight in the fridge. This prevents the rice from being too sticky and becoming a big mush ball. Note 2: If you are lazy/cheap/short on time, then a package of frozen veggies will do the trick. I like using mixed veggies (carrots, corn, and peas). My sister made fried rice once with Trader Joe’s frozen edamame. It was yum! Recipe Mash-Up. (Idea contributed by ZB.) Basically, because the recipes are technically perfect, my goal would be to put two disparate recipes together. Recipes that actually take less than one hour, from start to finish. And not from cans or prepared foods either. Do you have any thoughts or ideas? If so, I’d love to hear them. Please leave them below in the comments. Categories: cooking, recipe | Tags: Chinese food, projects, recipes, rice | Permalink. It occurred to me today, as I was making fried rice, that I’ve never shared my special sauce recipe with y’all. Allow me to apologize for being so rude! The following is a basic sauce recipe that I use for all of my stir fries, fried noodles, and fried rice. It doubles as a dipping sauce for dumplings. The magic of the sauce comes from the fact that it combines all of the major taste sensations: salty (soy sauce, hoisin), sweet (hoisin), spicy (hot garlic sauce), sour (vinegar), and umami/savory (soy, sesame). The great thing about this sauce is its versatility: when you want sweet, amp up the hoisin. If you’re feeling spicy, turn up the chili sauce. For a more saucey-sauce, add some water and a tablespoon or two of corn starch (make sure you dissolve the corn starch in water before putting it into your dish!). Since it seems weird to show you a picture of sauce, I thought I’d put up a photo of the fried rice I made. I’ll post the recipe for the rice soon! Fried rice with carrots, broccoli, and eggs. Oh, and magic stir fry sauce, of course! Note: for dumpling sauce, I like to add some freshly minced garlic. Categories: cooking, photos, recipe | Tags: Chinese food, sauce | Permalink.